Like most of the wearable fanatics around I got notified by Pebble about “the next thing” that they’re up to. And I think its great! Not only is it a next-gen smartwatch from the company that delivers the long-battery-life and affordable-but-functional watches; it brings us a cool new gadget that settles in smooth and gently between all the too-expensive-for-regular-joe Android watches and unfortunately-not-so-healty Apple watch that’s taking off in the 2nd quarter of 2015. Let me tell you about the greatness in this “next move” for a renowned company in a cutting-edge market. It does so by giving us a watch that has nice animations and a colorful GUI and still maintaining a multi-day-on-a-single-battery-charge user experience. And all that for a price about a $150 beneath the competition’s price setting! Okay, but why is kicking it on KickStarter so epic, you might ask? There are multiple reasons for Pebble’s return to KickStarter being an #epic move . Pebble being a company that has already proven itself and is surviving in a pond that they initiated and which was quickly crowded with big-time company fish that want a piece of it. Pebble planted a visionary seed on Kickstarter and the backers watered it to root the company that is now Pebble. Going back to the roots is a nice geste that gains sympathy and has both nostalgia and a humane flavor to it. Kickstarter is envisioned by most of us as a starting point for new products and companies that need the crowd for a healthy takeoff. Most of us would not dare thinking about a high-profile innovative company going back to the sandbox in which they learned about financing and build nice things. But when you come to think of it; why not? If you’ve proven to do greatness with a backed project and gave people something wonderful, you will only prove to be gaining the desired financing even faster for your next gig. And so it is for Pebble once more, hitting their goal faster than lightning this time. Bringing out a new product is one thing, but (not just reinventing the GUI, but) thinking of a very innovative and unique User Experience by using a “timeline” to let users pick timeline-related information and functionality on your wrist is just what an endboss would do. Giving back to all the first-gen Pebblers out there by letting them experience this innovative UX is just an awesome giveaway. 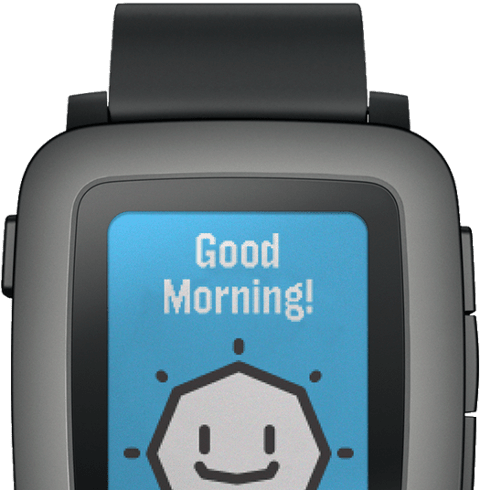 did you see out the cool online building environment for developing your own Pebble app yet? It’s on https://cloudpebble.net ? When building stuff over there you won’t be battling getting your machine setup with VM and python stuff so it’s a cool timesaver. Be sure to check it out if you digg a gadget-n-code cocktail as well! the new watch has a port for hardware add-ons so 3rd parties can make stuff that actually plugs into the watch and plays nice with the onboard soft- and hardware.. Looks like a new market for developing to me! So, taking all that in mind, they’ve already got an incredible record on their funding goal on Kickstarter and they are already finishing up on setting up the production line. The pawns are set and the game is ready to begin : which door will the public choose and which prize will they take home in May 2015? Apple with its sweet GUI and Apple platform integration for a bigger grab in the wallet or the sweetness of a weeks worth of battery along with color screen and an innovative UX build into the next-gen Pebble product?